Thursday's natural gas storage report weighed heavily on the market dragging futures down 1%. Thursday's EIA report confirmed a large bearish miss with a build of +23 bcf vs. consensus +10 bcf for the week ending March 29. Thursday's report tempered fears of a mid-April cool snap threatening supplies. Weak Permian prices could promote additional storage build. Downside risk is outweighing upside potential now after a very bearish storage report, weak Permian pricing, and a cooler mid-April that's not as feared as it was initially. The Energy Information Administration (EIA) released its weekly storage data Thursday morning. The report revealed a very bearish +23 bcf build in storage vs. the consensus expectations of a +10 bcf build. This brought inventory levels up to 1,130 bcf from 1,107 last week. The report was a huge miss for analyst/traders and tempered any hopes that any cool weather will be a threat to inventories. The South Central region led the way with a massive +35 bcf injection vs. the 5-yr average of +5 bcf. Overall, the +23 bcf increase to 1,130 bcf in U.S. inventories sharply narrowed the storage deficit vs. last year and the 5-yr average to -228 bcf and -505 bcf, respectively. 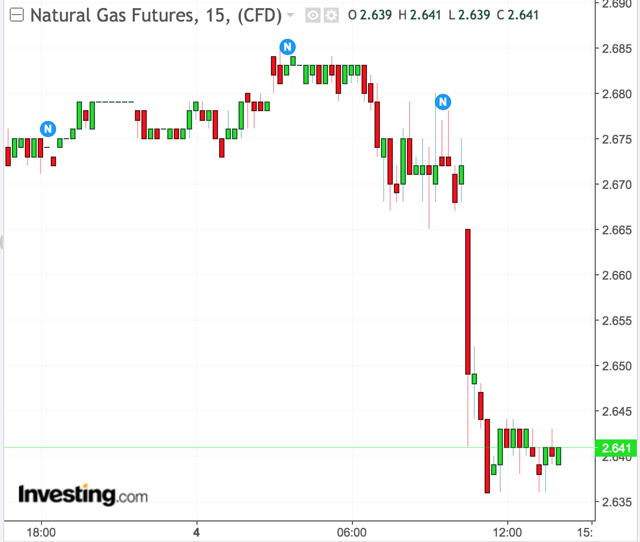 Immediately following the report, natural gas futures fell sharply with the front-month May futures contract settling down 1.27% or 3.4 cents lower to $2.64, and the June contract settling down 1% or 2.9 cents to $2.69. Figure 1 below is Thursday's (April 4, 2019) EIA Natural Gas Storage Report (Table Format) for week of March 25-29, 2019. 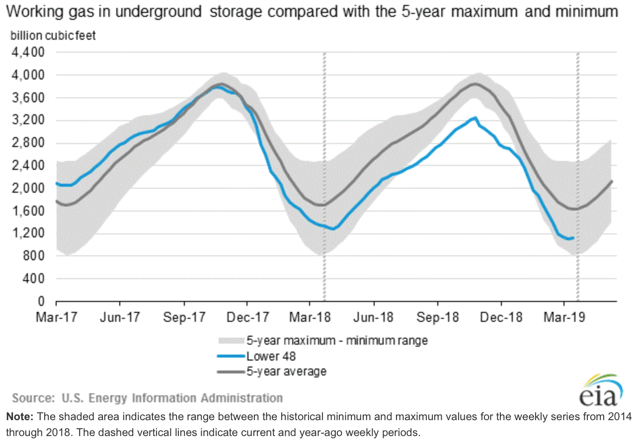 Figure 2 below is Thursday's (April 4, 2019) EIA Natural Gas Storage Report (Graph Format) for week of March 25-29, 2019. In addition, the West Texas market hubs have been under pressure from widespread gas production coupled with a lack of takeaway capacity. This combined with regional pipeline maintenance have resulted in all-time low Waha spot prices. Permian prices bounded back on Thursday, but pricing remains very weak. This weak pricing environment makes it appetizing for storage operators to buy gas at a cheap price. This could in fact increase storage build, another bearish potential. Meanwhile, the weather outlook in the near term remains the same with cooler changes coming mid-April. However, the combination of the EIA report plus the low Permian gas price situation have weighed heavy on the natural gas market creating an overall bearish sentiment and downside risk. The front-month May natural gas futures contract which trades on the New York Mercantile Exchange (NYMEX) settled slightly down only 1.27% to $2.64. Figure 3 below is a chart showing the price trend of NYMEX's front-month May futures contract over the past 24 hours. 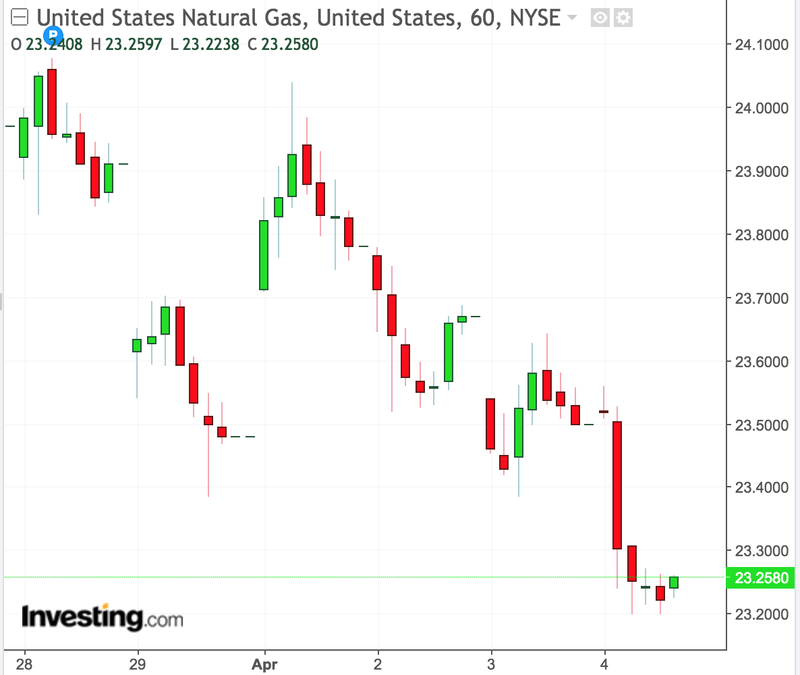 The United States Natural Gas Fund (UNG), which is the un-leveraged 1x ETF that tracks the price of natural gas, finished down 1.06% to $23.25. Figure 4 below is a chart showing the price trend of UNG over the past 24 hours. VelocityShares' 3x leveraged (UGAZ) and ProShares' 2x leveraged (BOIL) were seen down 3.34% and 2.49% to $28.06 and $19.99, respectively. 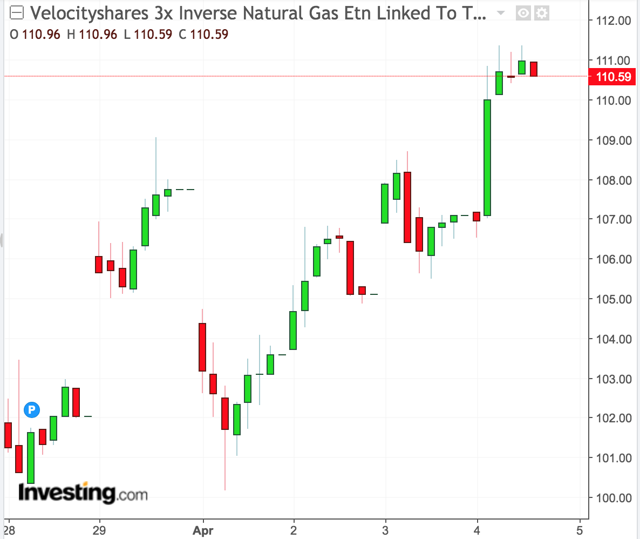 Meanwhile, VelocityShares' 3x inverse (DGAZ) and ProShares' 2x inverse (KOLD) were seen up 3.39% and 2.50% to $110.72 and $22.98, respectively. Figure 5 below is a chart showing the price trend of DGAZ over the past 24 hours.